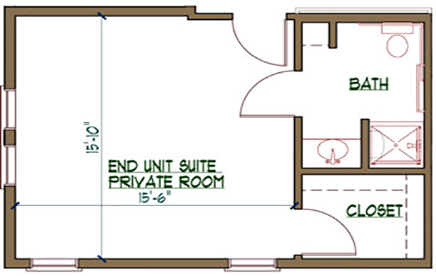 Resident suites at Jefferson's Sunset Ridge Memory Care are available in single or shared options. Each suite is equipped with independent climate control, private bath, large closets, and a beautiful view. Residents must furnish their suites and are encouraged to bring personal furniture items, wall hangings, and other comforts from home. Single Suites measure approximately, and have a total floor area of 295 sq ft. Large private baths and storage closets make these rooms an attractive option. 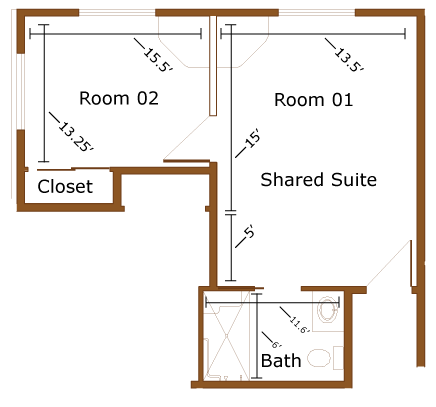 Shared Suites measure approximately, and have a total floor area of 414 sq ft. Each of the living spaces in shared suites have a square footage of between 203 and 208 ft.